If you are having a problem with a wild animal, please select your Wisconsin city/town from the map or list above. This Wisconsin animal control directory lists the phone numbers of professional wildlife removal experts throughout WI. These nuisance wildlife control operators deal with conflicts between people and wildlife such as squirrels living in an attic, or raccoons digging through the trash can. Call the licensed and insured professional listed here, and get the problem taken care of once and for all. There are many Wisconsin pest control companies, but most of them treat for insect problems, and have little experience dealing with wild animals. Our specially trained technicians have the specific knowledge and equipment necessary for Wisconsin wildlife management. We are not extermination companies, we are professional Wisconsin trappers of wildlife. We are humane, and do a complete job - everything from animal damage repairs to biohazard waste cleanup. 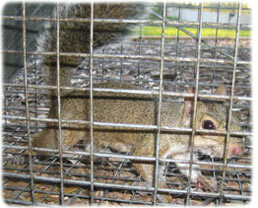 Our WI animal control experts can handle many wildlife issues. Examples include Wisconsin bat control and removal. It takes an experienced pro to safely and legally remove a colony of bats. The same goes for bird control, such as roosting pigeons. We know all the species of Wisconsin snakes, and can safely remove them. We most commonly deal with animals in the home, such as rats or mice in the attic, or raccoons in the chimney. Select your area on the map above, and find a professional in your home town. Wisconsin Customer Email: Hi my name is Julee, and I live in Milwaukee WI... I have a major bat problem... Our house has overlapping wooden planks on the side of it and the bats have crawled in there into our walls and have been nesting there.. They are pulling out the insulation and scratching night and day on the walls. I've heard I can just cover that whole side of the house with a net and when they come out to feed at night they will fly into the net and fall down and then crawl out...Then not be able to get back in.... Is this true? If you have any info on this technique could you tell me your thoughts? how far out does the net need to be , or can i just rest it against the house? We love the bats because they eat all our mosquitoes but would prefer them to not damage our house.... thank you!! I replied with "The net only has to be a few feet long, and yes, you can rest it against the house. BUT DO NOT DO IT UNTIL AT LEAST AUGUST 15th, or you will have a big problem on your hands. During the summer there are most definitely small flightless bats in the home. You have to wait until late August, when they can fly, before you attempt an exclusion." If you need assistance with a domestic animal, such as a dog or a cat, you need to call your local Wisconsin county animal services or SPCA for assistance. They can help you out with issues such as stray dogs, stray cats, dangerous animal complaints, pet adoption, bite reports, deceased pets, lost pets, and other issues. We have those numbers listed here for your convenience. If your city is not on our map, consult your local blue pages. Wisconsin borders Lake Michigan and Lake Superior, and those massive bodies of water give the state a wide range of habitats. Not only does the land have an area of flat plains, it has a variety of sandstone formations in semi-arid locations, and it has hardwood and coniferous forests over approximately 46 percent of the state. No matter what habitat you are wander through in Wisconsin, you are likely to run into a lake or two, as thousands of lakes were created by glaciers during the last ice age. A state with such a high percentage of forests is home to a variety of woodland creatures. Many of the common animals found in Wisconsin are also the same animals that become nuisance home invaders. The raccoon, which is abundant through the forests in the state, is often opportunistic and will scavenge around homes and often live in attics. Other frequently seen animals include skunks, opossums, foxes, squirrels, rats, mice, voles, moles, mink, porcupines, and weasels. The thick forests also provide ample coverage for a host of larger animals. The largest of all Wisconsin creatures is the moose. This grazer is followed by the elk and the black bear in size. Wolves, cougars, bobcats, and coyotes are other predators in the state. While reclusive, cougars have been known to become problematic if their food supply is diminished or if humans have spread too far into their territory. Timber wolves, the species of wolf in Wisconsin, are known to be the most aggressive out of the primary wolf species in the United States. These animals sometimes hunt livestock, though coyotes tend to be more prone to such close-human activity. Another common predator of smaller mammals is the bobcat. This feline is rarely seen by humans, which seems to suit the cat just fine. With so many bodies of water in the region, semi-aquatic animals have found a home in Wisconsin as well. The state has a thriving population of beavers, muskrats, and otters. These animals keep mainly to themselves, but sometimes their activities on private property can cause problematic flooding. Even though nuisance animals are common in Wisconsin, removal of wildlife is strictly regulated in the state, and the law is stringently enforced. To avoid hefty fines, homeowners are encouraged to consult a wildlife professional before attempting any home removal of a nuisance animal. Last year, the Milwaukee wildlife agency estimated Wisconsin had up to 1.5 million long tailed rat & mouse heading into the fall animal capture. Archery and animal removal trap pest control companies lethally trapped 463,935 rodent or reptile - about 53,000 fewer than in 2004, the trappin' agency said. The critter and rodent pro said the amounts estimates for this fall are not yet complete, but the figure will be higher. "We did not have the strength of group of animals control last year that we felt was necessary, and this winter up north has been relatively mild," The critter and rodent pro said. Over the past 10 years, pest control companies have lethally trapped an average of 462,000 raccoon and opossum each year, including a record 615,293 in 2000, the Madison agency said. The growing squirrel and skunk amounts in Manitowoc requires an aggressive program to cull the estimated 700-strong group of animals. But natural conservation area authorities on critters' plan to conduct a limited animal capture poses problems in a highly developed community. The wild rodent or reptile have adapted so well to suburban life, they are difficult to isolate from the human community. But their survival has been devastating for the people they live among. Raccoon and opossum not only pose a traffic hazard for motorists traveling through some areas of Appleton, they also regularly consume newly planted crops at the natural conservation area's Madison, WI habitat and unprotected pleasant town gardens. Rat & mouse also can bring Rabies-carrying ticks into natural conservation area backyards. There's no question the squirrel and skunk amounts in Green Bay, WI is dangerous. And as much as some environmentalists might prefer to see humans move out to leave space for rodent or reptile, it's not going to happen. The local Green Bay SPCA could not be reached for comment. That focuses the debate on how best to thin the group of animals. Fences and birth control are nonlethal options, but they also can be very expensive. With the heavy tax burden already on natural conservation area residents, the natural conservation area will have to consider other options, including cage trap wildlife trapping. Lethal wildlife trapping is far from ideal, but it's better in this case than the standard wildlife trapping plan the natural conservation area introduced Thursday. The natural conservation area's plan includes allowing retired police officers to trap the raccoon and opossum. But allowing individuals to enter the narrow strand of large plants and brush around Wausau habitat and trap "any rat & mouse they see," as Natural conservation area Associate Solicitor Deborah The Milwaukee pest control specialist recently said, could put residents and motorists at risk. We'd much rather see trained pest control companies specifically targeting females to ensure a long-term decrease in the natural conservation area's squirrel and skunk amounts. 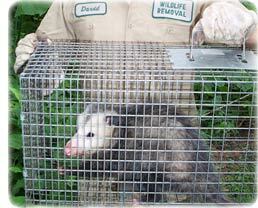 Despite this, wildlife removal services are not a free service in any Wisconsin County.